After reading the description, I had high hopes for this book and I really wanted to like it more, but several things troubled me. I still have no idea what a Seeker is, who they’re protecting, and from what or whom. From the setting description, I was under the impression the time period was the late 1800’s or early 1900’s, but then a television and movie stars were mentioned, so I’m a little fuzzy on when the story takes place. There were also time jumps in some of the chapters and, at times, I wasn’t really sure where we were. The characters were interesting initially – training to be Seekers, full of excitement and determination. Quin showed promise as a strong female protagonist, John’s backstory seemed mysterious, and Shinobu added some humor. Soon after, they all went in unexpected directions, and some of their actions seemed out of character and illogical, given what we were told about them. Then, the love triangle showed up, which I found difficult to swallow. Yes, technically Quin and Shinobu are distant cousins, but they were raised their whole lives as family, so Quin’s sudden realization of her ‘feelings’ for Shinobu seemed implausible and a little creepy. Despite all this, there were some things I did like – the action sequences were well-written, exciting, and dangerous and I could easily picture them. The chapters were written in alternating perspectives, giving me a peek inside the characters’ thoughts and reasoning behind their actions – which didn’t always help. If I had better insight to the actual concept of this story, I’m pretty sure I’d be more intrigued. Although I understand the author not wanting to give an info dump or reveal all her cards at once, it interfered with the cohesiveness of the story, leaving me very frustrated, with too many unanswered questions. 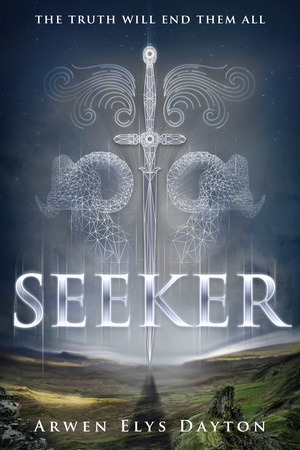 Seeker is scheduled for publication February 10, 2015. This review is based on a digital ARC from the publisher through NetGalley. This almost sounds like a focus tested book brought to you by a committee. Almost like a paint by numbers painting. And the marketing is weird, I would never include Hunger Games readers with Game of Thrones readers, very different markets (that’s not to say that there isn’t overlap but I would never market it that way, lol). HaHa! You’re right – odd combination and seems like you’re setting a book up for failure using those comp titles – highly loyal fans feeling a little misled.